AudioControl's SA-4140i SPL microphone allows you to use your compatible iOS device as a real-time analyzer. AudioControl's SA-4140i SPL microphone allows you to use your compatible iOS device as a real-time analyzer. A real-time analyzer (RTA) is a very useful (and usually expensive) device that displays the levels of the different frequencies played by the speakers in a given space, so you can equalize the overall response. First, you play a signal containing all the audible frequencies (called pink noise) through your sound system. Next, you measure the response using a microphone connected to the RTA, viewing the frequency response curve on the RTA's display. With this microphone and AudioControl's Mobile Tools app, you can now use your smartphone to analyze the acoustics of almost any system. AudioControl calibrated the SA-4140i SPL so the relative values of each frequency band will be accurate. 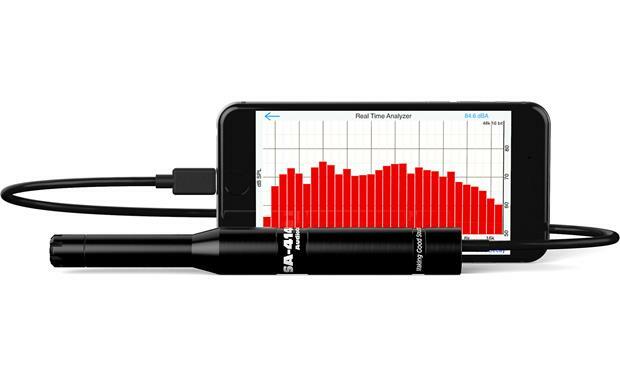 With the app, you can also use this microphone to measure your system's loudness — up to 140 dB SPL (about the loudness of a jet taking off). The mic also features an audio output jack to send the test tones and noise generated by the app to your system, and an AC adapter to keep your device's battery charged during lengthy tuning sessions. Measurement Mic: The AudioControl SA-4140i SPL is a calibrated, full-range, omni-directional test and measurement microphone for direct connection to Apple Lightning-connector iOS devices running iOS 6.1 or later. With the SA-4140i mic and the AudioControl Mobile Tools app, you will be able to analyze the acoustics of any environment with high resolution and precision, using the processing power of your Apple Lightning-connector iPhone, iPod touch or iPad. The AudioCotnrol SA-4140i SPLmakes set up of any sound processor a breeze, too, letting you see the acoustical spectrum and take action. Microphone: The SA-4140i SPL microphone has been redesigned with a 1/2" nominal diameter head to minimize the effect of high-frequency diffraction for the flattest possible frequency response. The microphone also features increased maximum SPL handling - up to 140 dB SPL. Audio Output/Power: The SA-4140i SPL is especially suited to work with an iPhone 7 by providing an audio output jack to send test tones and pink noise to your phone while running the setup. The mic also includes a charging jack for the provided AC power adapter. This will keep your iOS device charged during extended testing. If not using the included AC power adapter, the microphone will get power from you iOS device, drawing approx. <50 mA. Mobile Tools App: You will need to download the free Mobile Tools app from the Apple App Store onto your compatible Apple Lightning iOS device to gain full capability of the SA-4140i microphone. Using the app, you get five powerful calibration & measurement modules - including RTA, FFT, SPL, & Polarity, plus the proprietary DQ-61 Delay module (requires AudioControl's DQ61 or DQX processor). Now you can test your sound system audio using a professionally designed test and measurement app. With this microphone directly connected via the Lightning connector to your compatible iOS device, and the Mobile Tools application loaded, you will be able to analyze the acoustics of any environment & sound system, such as your car stereo system or home theater system. Note: The SA-4100i calibration data is transferred to the Mobile Tools app, and it is ready for use as a fine audio analysis system. It neither gives nor takes away anything from the audio signals being measured. You will need to manually adjust your systems settings, connections, and configuration based on measurements displayed on the Mobile Tools App. White & Pink Noise Test: The Mobile Tools application allows you to send out audio test signals from the headphone output jack of your Apple Lightning iOS device to play through your sound equipment and speakers. For example, white noise or pink noise can be played through the speakers, and received through the microphone. RTA (Real Time Analyzer): The RTA (Real Time Analyzer) will display a graph that shows the Sound Pressure Level (SPL) measured by the microphone across the audio frequency band from 20Hz to 20,000Hz. This lets you see where the measured response starts to decrease in which frequency range. FFT (Fast Fourier Transform) Analyzer: The FFT graph will the Sound Pressure Level (SPL) across the audio frequency band 20Hz to 20kHz, after the Fast Fourier Transform has been applied mathematically to the microphone measurements. FFT spectrum analysis gives early clues to any audio distortion in the system. This distortion may occur through speakers being overloaded, amplifiers going into clipping, mixer signals overloading, and so on. Polarity: The Polarity test allows you to analyze the speakers in your system and determine which of them may be wired out of phase compared to the others. For example, the positive and negative speaker cords may be swapped on one speaker, giving rise to an audio cancellation, most noticeable at the lower frequencies. SPL (Sound Pressure Level) Meter: This SPL Meter shows the measured Sound Pressure Level. This is very useful in setting up a system and determining for example, that the SPL does not reach unsafe levels that may cause hearing damage. DQ-61 Delay Module: This proprietary Delay Module allows you to analyze and adjust the front speaker delay and subwoofer delay in your AudioControl DQ61 or DQDX system (sold separately). You'll see a display of the details regarding the front and subwoofer delay adjustment procedures, so you can make the appropriate adjustments. Microphone Calibration: The microphone can support two calibrations for easy recall - Low Range for quiet listening environments & High Range for those loud moments. Or, the mic can be set to Auto. App Adjustments: The Mobile Tools App contains various settings that allow you to maximize the enjoyment of your microphone-user-experience. Items include Screen Contrast, Microphone Filters, Display Units, 16 or 24 bit Operation, & Sample Rate. Will this work with iPad mini 4? Couldn't find a definitive answer in the information given. Yes, as long as you have the same connector, no reason why it should not work. However, you can always give Audio Control a call just to confirm and be on the safe side, but I don't see why it wouldn't work. That really is a good question. The mic has a lightning connector on it, so it should, but the iPad mini 4 is not specifically listed in the literature or the manual. I can't imagine it wouldn't, but a call to Audio Control might be a good idea just in case. Note that "Gen 4" iPads are listed, so I can't really believe that it wouldn't be compatible. It's really a great tool to set up any system, car or home, and I highly recommend it. 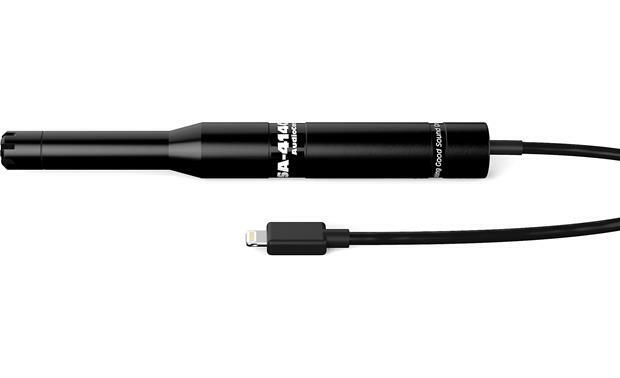 Searches related to the AudioControl SA-4140i SPL Calibrated RTA microphone for iOS devices — analyze your sound system.